My old Jewish youth group chapter, Judge Saul Pinchick AZA 6, in Denver, has a Facebook fan page. Its profile picture is a shot of the members of the Delta Tau Delta fraternity from the movie Animal House, which either shows a certain continuity of culture from when I was in AZA 6, or simply illustrates what a seminal work (the second definition) that film was in creating the vision of a society to which so many fraternal organizations aspire. When I was president of that chapter, we had a social event called The Food Olympics, that was a series of eating competitions. Being a Jewish youth group, we would say the Hebrew blessing appropriate for the food that we were about to try to eat more of faster than our fraternal brothers. Instead of firing a gun, or shouting "go," or counting down from 3, to signal the start of the competition we would say "amen." The regional adviser at the time suggested that perhaps we were being sacrilegious — actually, she said it outright and wasn’t very nice about it — and in retrospect she had a point. But it still won an award at the B'nai B'rith Youth Organization international convention as the best social function of the year. I think it won in large part because I filled out the application using all the typographical bells and whistles that were available on my family's new MacIntosh 128k computer. It being 1983, unusual shadowed fonts were novelties that likely impressed the judges. So I was delighted to receive the press release below a few minutes ago — so delighted that I thought I’d write a blog entry about it. Because Jeff Ackerman was also in AZA 6 at the same time I was. He didn’t participate in the Food Olympics as he was already Grand Aleph Mazkir (AZA language for international secretary) and didn’t fiddle much with our little chapter activities. BOSTON – (January 29, 2010) – Winter is heating up thanks to Qdoba Mexican Grill’s spicy sixth annual Rice & Bean Pot Burrito-Eating Contest, scheduled to sate appetites at the Paradise Rock Club on February 10. 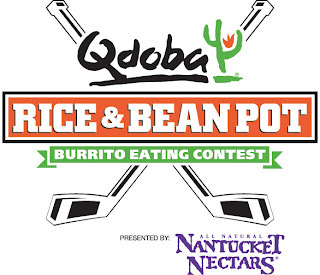 In celebration of Boston’s real Winter Classic, the venerable Beanpot College Hockey Tournament, Qdoba Mexican Grill will give students from Boston College, Boston University, Harvard University and Northeastern University the chance to demonstrate their speed — and appetites — as they battle for the coveted Rice & Bean Pot championship title. The high-stakes competition consists of four teams of four students from the Beanpot schools facing off in a speed-eating showdown for ultimate bragging rights and a trip for four to Mexico. Teams of four students may register at www.riceandbeanpot.com or by emailing matt@chair5.com with the names, phone numbers, and email addresses for all team members. The first 25 teams to register will compete in the preliminary competition round. Tickets for the Rice & Bean Pot finals may be purchased for $10 in advance at www.riceandbeanpot.com or by calling the Paradise Rock Club box office at 617-562-8820. Tickets purchased at the door cost $12. Proceeds from the event will benefit the Kevin Youkilis Hits for Kids Foundation, a charitable organization focused on raising support and awareness for the health, advocacy, safety and well-being of children. The Rice & Bean Pot also features Qdoba’s Beanpot Battle of the Bands, with bands from BC, BU, Harvard, and Northeastern — all voted into the battle by their respective classmates. Local band Bad Rabbits will headline the event with their soulful dance blend, while WAAF-FM’s morning-show host Greg Hill will serve as the evening’s host. As part of Qdoba’s support of Kevin Youkilis Hits for Kids Foundation, the fast casual restaurant will offer the baseball star’s personally designed “Youk Burrito,” a chicken queso burrito with a choice of fajita or grilled vegetables, at all Qdoba locations in Massachusetts. A portion of the proceeds from every Youk Burrito will benefit Youkilis’ foundation. It goes on for a bit more, but you get the idea. "Everything was fine until the inspector looked on our menu, saw the Earl Grey MarTEAni, and told us that ... even with the warning we have printed on our menu about raw eggs, using raw eggs is a violation ... and that we have to switch to pasteurized eggs in our cocktails." No-doubt the American Egg Board, egg producers' promotional body, would support the move, because they support anything that helps prevent food poisoning from eggs (wouldn't you? I mean you don't want people getting sick from your product), but in fact only one in about 20,000 eggs contains salmonella, according to the AEB. I tell ya, eggs get a bad rap. They're not likely to raise your blood cholesterol either. From what I understand, the biggest contributing factor to blood cholesterol is genetics, and after that it's saturated fat. Eggs have a lot of dietary cholesterol, but not much saturated fat, and, counter-intuitive as it may seem, dietary cholesterol doesn't contribute to blood cholesterol. In fact, egg yolks are really good for you. They contain all sorts of good micronutrients, including folate, Vitamins B6, B12, A and E, a bit of D and all sorts of carotenoids, which are good for your eyes, like carrots are. Egg whites are pretty much protein. It’s official: Korean will be the next big ethnic cuisine in America, at least according to the 33 readers of this blog who were good enough to respond to my poll on the topic, eight of whom picked Korean. Seven picked Indian and, well, you can see the results yourself below. I asked about Roman cuisine because we've seen a little trendlet of Roman happening here in New York, as Florence Fabricant reported in The New York Times last week. I asked about Scandinavian because that was advocated by my friend Jody Eddy of Art Culinaire. She’s been on a big Iceland kick lately. Technically, last time I checked, Iceland wasn’t part of Scandinavia, but it’s close enough. I mean, they’re practically Vikings up there. I think it’s interesting that regional Italian got no (0) votes. I’d be curious to know what the three people who said the next cuisine would be one I didn’t list think the next cuisine will be. If you’re one of those people, or even if you’re not, feel free, by all means, to comment below. My next poll is in honor of the fact that we’re in the planning stages of our next MUFSO conference and, as always, we’re looking for feedback. What will be the next big “ethnic” food to emerge in the United States? Rock of Ages is not a good show. You might enjoy it, especially if you like those songs from the mid-1980s that currently are most popular in karaoke bars, but it’s not a quality production. A paper-thin plot ties together a medley of songs performed with medium gusto, often choreographed by someone who didn’t seem to be listening to the lyrics (an ensemble performance of Whitesnake’s “Here I Go Again” — “Here I go again on my own/Goin’ down the only road I've ever known/ Like a drifter I was born to walk alone” — excuse me? ), ending, lest there be any doubt that the soundtrack was thrown together to strike a chord with the lowest common denominator in pop culture, with Journey's "Don't Stop Believin',” which is enjoying new popularity, as you probably know, because it was the last thing heard in the final episode of The Sopranos. Still, it’s a fun show. You spend a couple of hours watching attractive, talented people sing and dance on stage, and I had a good time watching it with Johnny Rockets’ new president and chief executive, John Fuller. John loves Rock of Ages. This was his second time seeing it. “It’s like Broadway for Dummies,” he says. He has a point. It’s not like the performers are taking themselves seriously, and to emulate a stadium concert from the 1980s they hand out tiny flashlight-like things that light up when you push a button, simulating in a Broadway sort of way the lighters that people would use at those shows. And they sell beer — Corona Light or Coors Light — so through the course of the performance I had four Coors Lights. It’s sort of ironic kitsch for the masses. John, who was just promoted from chief financial officer to CEO, is the opposite of pretentious. He’s 6'6" but he usually flies economy class to help control costs, and he says his biggest personal thrill since getting his promotion was the reaction of his daughters, 12-year-old Bryanna and 10-year-old McKenna, when he told them. They were tremendously excited and told him how proud they were. I decided to let my snobby side out and drank an Irish single malt whiskey I'd never heard of. John had Amstel Light. The biggest self-deceptions are that life has a “meaning” and that each of us is unique. That’s a favorite quotation of my friend Kenyon Phillips from one of his idols, David Byrne (his other big idol, musically, at least, is Brian Eno). Perhaps that quotation sounds bleak to you, but it’s not really. If life has no set meaning then we can imbue it with whatever meaning we like. We can point our own moral compass, seek our own destiny, live life as we think we should. That’s wonderful. Not that Kenyon’s incapable of being bleak. He’s a warm, thoughtful, good-natured guy, but he has a pronounced dark side, and the lyrics to his music are full of pain and aggression and reflections on destructive, often masochistic relationships. He gets a kick out of that. Philosophy was in order last night, as we were eating in what is possibly New York City’s most philosophical restaurant, Rouge Tomate. Okay, so it’s sourcing local, seasonal products and preparing dishes from them that keep nutrition in mind. That’s nice. It’s kind of taken for granted in the cuisines of China, Japan and much of South Asia and Southeast Asia, so I don’t know that it’s particularly innovative. I get skeptical any time someone tells me they’re doing something innovative. And the more words they use to describe what’s innovative about what they’re doing, the less innovative it usually is. However, it’s worth noting that flavor and taste aren’t mentioned in the restaurant’s principles. Maybe Mr. Verstraeten thought it went without saying that the food should taste good, although anyone who has been subjected to “health food” knows that it shouldn’t go without saying, that for decades Americans claiming to proffer food that was good for you were so smug about its healthful qualities that they seemed uninterested in making it tasty. I’d heard only good things about Rouge Tomate since it opened in October of 2008, though. I’ve also had good interviews with Rainlove Lampariello (Rainlove, I know! ), who’s in charge of the restaurant’s beverage program, and I’ve always enjoyed the work of its chef, Jeremy Bearman, whose food I last had when he was at Lark Creek Steak in San Francisco. So it made sense for Kenyon and me to check the place out. [update: it turns out that Rainlove’s not with Rouge Tomate anymore. Taking up the slack at the moment is executive sommelier Pascaline Lepeltier, a very nice woman from the Loire region — which is where France’s most popular restaurant wines come from — who recently places third in the Best Sommelier of France competition; that’s the best a woman has ever done in that contest]. Kenyon’s a teatotalling vegetarian, so I like to take him to restaurants with strong non-alcoholic beverage programs and an emphasis on good produce. Those restaurants should be able to put their best feet forward with him. Kenyon and I spoke of many things as we ate — I ate his amuse-bouche of salmon tartare and avocado, and the scallop mid-course that Jeremy sent out for us — such as Avatar, and Kenyon’s favorite parts of the Marquis de Sade. Thank you for participating in my latest poll, which I think garnered some interesting results. I asked what you expected to be the driving factors influencing trends in 2010, and I let you pick more than one response. So from 24 respondents I got 38 answers. Most people ticked the economy, not surprisingly. But the next highest-scoring category was street foods. I wonder if that’s really a big trend or if the chefs who read this blog were simply really jazzed about the Culinary Institute of America’s recent World’s of Flavor conference, which covered the topic of street food. I guess we’ll find out as the year unfolds. Only four respondents ticked “flavor,” perhaps because it sounded vague or silly or obvious. But according to research my colleagues and I either did or reported on for our upcoming January 11 “Forecasts & Trends” issue of Nation’s Restaurant News, the most important driving factor for customers deciding what to eat isn’t nutrition profile or convenience or even price, and it’s certainly not environmental concerns. It’s how the food tastes. Indeed, long-term studies of consumer attitudes with regard to food indicate that flavor is more of a factor now than it was just a few years ago. You can find the full results of my Food Writer's Diary poll below. For all the goodies in our Forecasts & Trends issue, you’re going to have to wait until Monday, and even then, I’m pretty sure some of the info will only be available to subscribers. 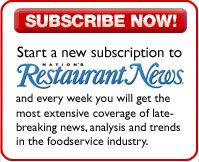 If you’re in the unfortunate position of not being an NRN subscriber, you can remedy that situation by clicking here. The poll results are below, and a new poll is on your right. Enjoy it, and feel free to write in comments below. Does anybody talk about fusion cuisine anymore? I’m pretty sure they don’t. I think it has gone the way of Continental cuisine. But Susan Rike wasn’t taking any chances last night as she hosted a press dinner for a new client of hers, Favela Cubana. The seven-month-old restaurant on the garden side of LaGuardia Place between Bleecker and West 3rd, right next to Rhong Tiam, serves Cuban food and Brazilian food, "but not fusion," Susan said as many as 150 times last night. So Cuban ropa vieja sits right above Brazilian picanha ná chapa on the menu, but there's no picanha vieja, no mofongo feijoada. That's not to say chef Oscar Santana — a French-trained chef from Mexico City — doesn't add his own flourishes. Of course he does. He's a chef. His boss is Marco Britti, an Italian, from Naples, whose background is in drumming. He was Marc Anthony’s drummer, he was the drummer for Jennifer Lopez' album Rebirth, and he’s currently the drummer in a band called Shadows Lie. Given the popularity of Italian and Mexican food in the United States, you might wonder why Britti and Santana would commit themselves to cuisines that, like all “ethnic” cuisines except for Chinese, are less popular than Italian and Mexican. Britti kind of shrugged when I asked him that, but, well, a person has to follow his dreams. Even though people don’t talk about fusion cuisine anymore, they do cook it. I mean, really, all cuisine is fusion. No culture is so isolated that it doesn't have dialogue, as the anthropologists say, with other cultures. All cuisines evolve, and in the melting pot of New York there’s no reason why practitioners of one cuisine can’t learn from practitioners of others. Besides, you can’t be 100 percent “authentic,” whatever that means, anywhere other than where a dish originated. Basil in the United States tastes different from Italian basil, for example, so a caprese salad here can’t be completely "authentic." I’m sure passion fruit in Brasil has a zing that it doesn’t have here. That’s just the way it goes. Many chefs still cook fusion food proudly, even though they don’t call it that anymore. I'm thinking of Anita Lo's chicken and Thai basil dumplings at Rickshaw Dumpling Bar, or Chris Cheung’s liquid foie gras bao or crispy short rib gold coins with truffle-sriracha foam at China 1. Fusion food shouldn’t be feared, only bad fusion food should be, and, really, that’s true of food generally, isn’t it?